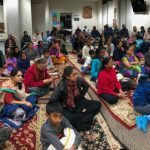 With the blessings of our Guru Maharaj Sri Sri Muralidhara Swamiji and the divine couple, Smt Madhuri Sakhi Sametha Sri Premika Varadhan Thakurji, Seattle G.O.D satsang, led by Sri Poornimaji, hosted Rama Ratna Mala (Ramayana katha) and a Seetha kalyanam from Thursday, May 5th, 2016 up to Sunday, May 8th, 2016 at the VEDA Sri Venkateshwara Temple in Redmond, Washington with over 125 devotees attending across all days. Rama Ratna Mala happened on all four days in the evenings. 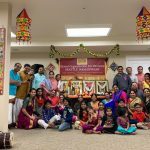 Each Rama Ratna Mala session commenced with various performances by the Seattle Gopakuteeram children. 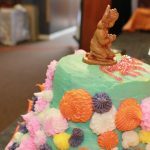 This included shloka recitation, rendition of Madhurageethams, instrument recitals and more! 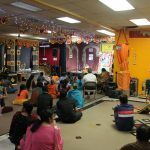 Sri Poornimaji’s lectures followed these performances and filled the ears and hearts of all the listeners with the nectarine stories from Ramayana. 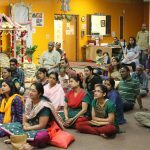 Sri Poornimaji completely captivated the devotees as was evident from several devotees who repeatedly came back eagerly for more shravanam. 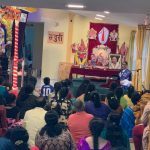 On the poorthi day of Rama Ratna mala (Sunday, May 8th), a Seetha Kalyanam was performed where Sri Ramachandra Prabhu and Smt Seetha Devi were married in a divine unison to the blissful rendering of various ashtapadis and namavalis by our Seattle G.O.D singers (Lakshmi AIshwarya, Bhavani Ram, Sreepriya Bala, Sandhya Anand and Gopakuteeram children) accompanied on Mridangam (Jagadeeshji) and Harmonium (Venkatji). 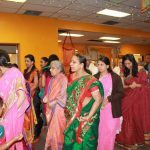 The agenda for the marriage also included divya naamam and Hanumat utsavam. 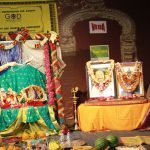 The poorthi day was extra auspicious since it was Akshaya Thrithiyai. 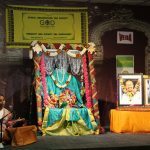 Sri Poornimaji handed out Sri Kalyanam Srinivasa perumal prasadham, pictures of Sri Kalyana Srinivasa Perusal and Sri Sri Muralidhara Swamiji, and a coin to all devotees who attended. 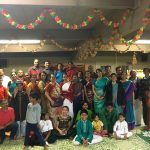 Devotees then partook kalyana prasadham and seer to celebrate the poorthi. 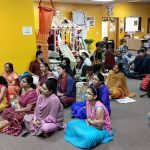 Sri Poornimaji concluded her stay in Seattle with satsangs at the homes of various devotees on Tuesday, May 10th and Wednesday, May 11th, where she talked about various topics including Bhagavatha dharma and bhaktha charithram. 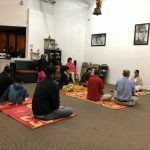 Apart from the home satsangs, Sri Poornimaji also led an introspection session with the Gopakuteeram children in order to help them build a strong foundation for leading a truly contented life.